I’m not the world’s top expert at saying no. Yes eases off the tongue a good bit easier for me. Saying no is something I have to practice and be intentional about. If not I’ll end up on 23 committees, with 47 projects, stressed and way over committed. However, some things are easier to say no to. Can you give me your username and password so we can share the account that you pay for? No. Can I drink the last bit of your milk. No. Can I drink your last Dr. Pepper 10. No. Can you fold my clothes? No. Can I use your toothbrush? No. Okay. I’m mildly being silly. I probably would let you drink the last of my milk and my last Dr. Pepper 10. But I have to give myself a pep talk every time I fold my own clothes, so good look with that. And no. I really won’t give you my password and username or let you use my toothbrush. Bacon. Who can resist? Not me. I actually don’t eat bacon often. I do “real” bacon bits on my salads and in green beans, but I don’t crave/need/want/must have bacon until Spring and Summer. Why? Thee letters. B – L – T. So simple. So classic. So perfect. So irresistible. I actually don’t enjoy the traditional bacon or way of cooking it. It’s greasy and poppy and makes the entire house smell like grease. However, when I started Weight Watchers I discovered Oscar Mayer Fully Cooked Bacon. It’s center cut [read less fat], microwavable, AND only TWO points per serving. And a serving? FOUR slices! I haven’t bought or had it since fall arrived. My taste buds and brain are weird about crossing things I consider to be seasonal foods over to other seasons. (Examples: I can’t eat soup or grilled cheese unless it’s Winter or Fall. I can’t drink hot beverages in Spring and Summer. I don’t eat guacamole, watermelon, avocados or pineapple in the cold weather seasons.) So, I equate BLTs with Spring and Summer. Fresh tomatoes from my Pawpaw’s garden are probably to blame for this. Here in the HOT great South, we’ve been in full Spring swing since January. (A slight exaggeration but not by much.) 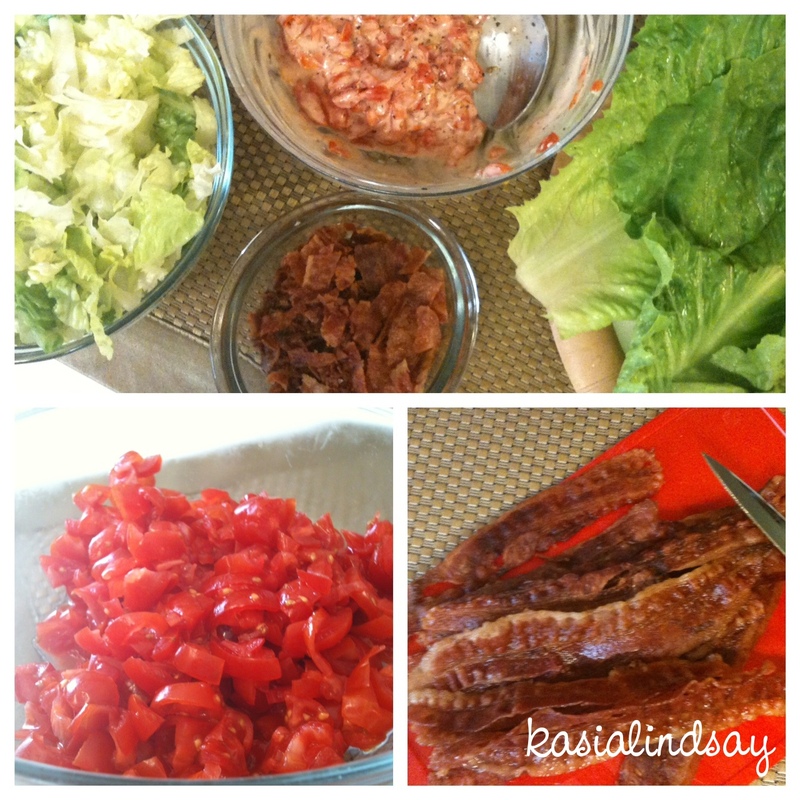 I pinned Skinnytaste’s BLT Lettuce Wraps long ago, in anticipation of seasonal BLTs. I pretty much followed her recipe exactly with a few minor alterations. 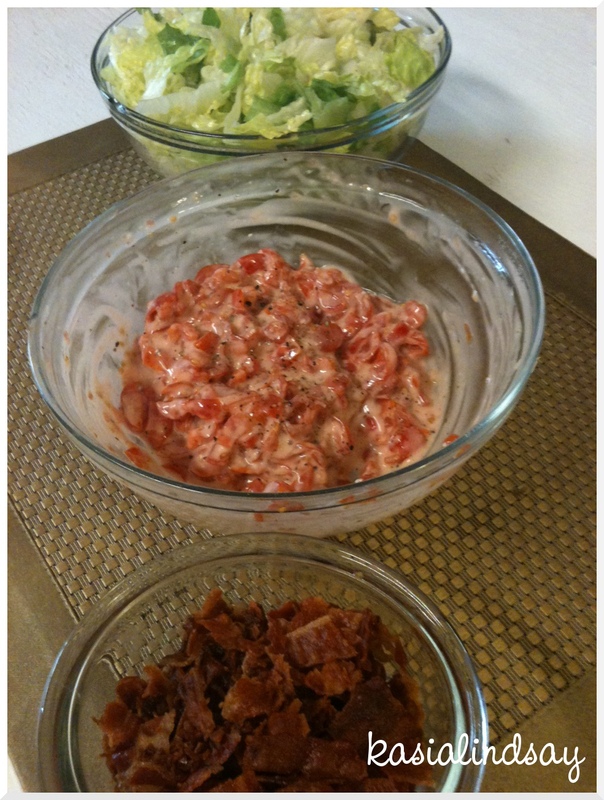 I used fat free mayo, the aforementioned microwaveable bacon, romaine lettuce leaves, and chopped grape tomatoes. I recently attempted my first Lettuce Wraps with iceburg leaves as she suggests. I failed! They broke and did not work at all for me. A head of romaine is $1.00 at Wal-mart and seems to be a little more substantial to me. 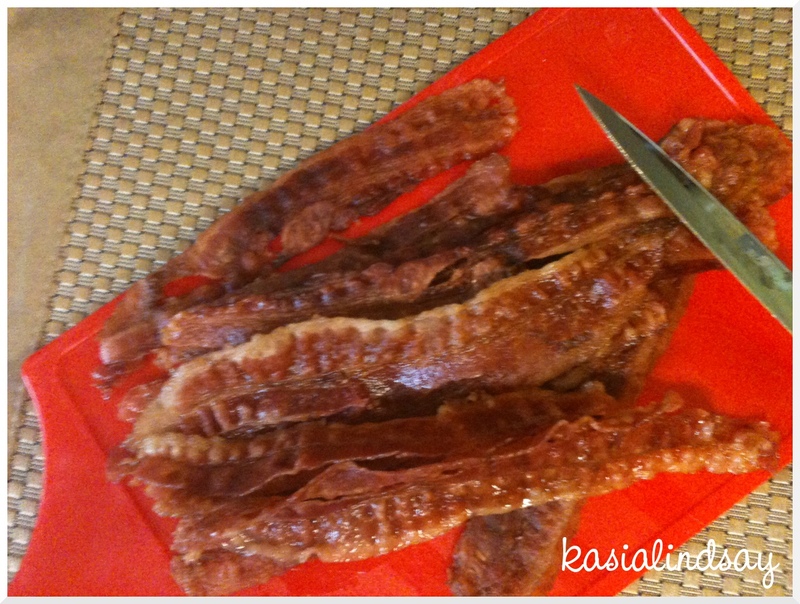 Microwave 8 slices of bacon at a time for 60 seconds. Blot off excess oil. Chop and set aside. Chop grape tomatoes. I cut them in half, then little circles and discard the excess seeds and juice. Stir mayo into tomatoes. Add salt to taste to tomato mixtures. I wouldn’t add too much, because the bacon has a natural saltiness. Add fresh cracked black pepper to mixture. My recipe yields 3 servings of 2 wraps per serving. 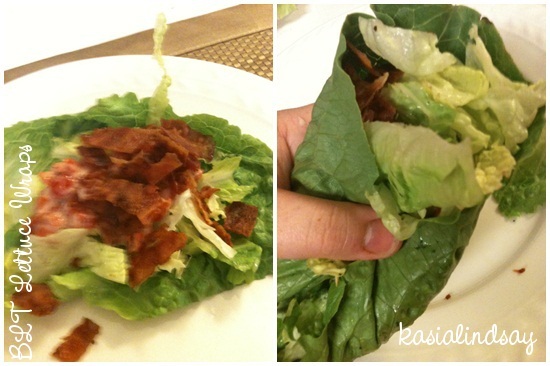 To build a wrap sprinkle a little chopped lettuce in the romaine cup. Spoon 1/6th (a couple tablespoons) of the tomato mixture on top of the lettuce. Sprinkle 1/6th of the bacon on top. Tuck the bottom harder end in a bit and then roll the lettuce wrap over from side to side. It’s a little flimsy still, so I just wrapped mine in a napkin. Each serving (2 wraps) is 4 points on Weight Watchers according to the recipe builder. I served these with baked zucchini sticks and baked sweet potato fries dipped in skinny caramelized onion dip (recipes coming soon).